Crazy name: The secretary bird’s English name was once thought to come from the 1800s, when Europeans first spotted these birds. Back then, male secretaries wore gray tailcoats and dark knee-length pants. They also used goose-quill pens that they carried behind their ears. This long-legged bird shares many of these same physical features: long, dark quills at the back of the head; long, gray wing and tail feathers that resemble a tailcoat; and black feathers that go midway down the legs like short pants. It's fun to imagine how the two "secretaries" compare! Secretary birds are distantly related to buzzards, vultures, harriers, and kites. But unlike their raptor cousins, secretary birds spend most of their time on the ground. But can they fly? Of course! They may spend their days on the ground, but secretary birds are good fliers and nest and roost high up in acacia trees at night. In flight, their long legs trail behind them in the air. Long, stork-like legs hold most of the bird’s body above vegetation, giving it a better view of potential prey. Native to Africa, secretary birds are found south of the Sahara Desert, from Senegal east to Somalia and south to South Africa. Standing over four feet tall, the elegant birds cruise through grasses on long legs while looking for a bite to eat. Secretary birds prefer savannas with scattered acacia trees and short grasses where they can easily see while strolling. A few hours after dawn, secretary birds drop down to the ground from their nighttime roost to start the daily hunt. Pairs of secretary birds keep track of what's happening in their territory, which can be up to 19 square miles (50 square kilometers) in size. They are known to cover more than 20 miles (32 kilometers) in a day of hunting. Secretary birds search for food throughout the day—resting in the shade of a tree during the hottest part of the day—and return to their roost just before sunset. Secretary birds and caracaras are the only terrestrial birds of prey, hunting for their food on foot. Adults are often seen working in loose pairs, or even small family groups, stalking through grass in search of small mammals, reptiles, birds, and large insects. They are well known for their ability to catch and kill snakes of all sorts, even venomous ones! Secretary birds are clever enough to take advantage of recent fires, scavenging throughout the burn site for small animals that were unable to escape the blaze. These clever birds use two different hunting techniques. They catch prey by chasing it down, and then they either strike it with their bill or stomp on it until the prey is dead or stunned enough for the bird to swallow, usually whole. When attacking prey, the birds spread both wings and raise the feathered crest at the back of the head. Some studies suggest that dinosaur-like terror birds that wandered the Earth five million years ago may well have used this same attack strategy! 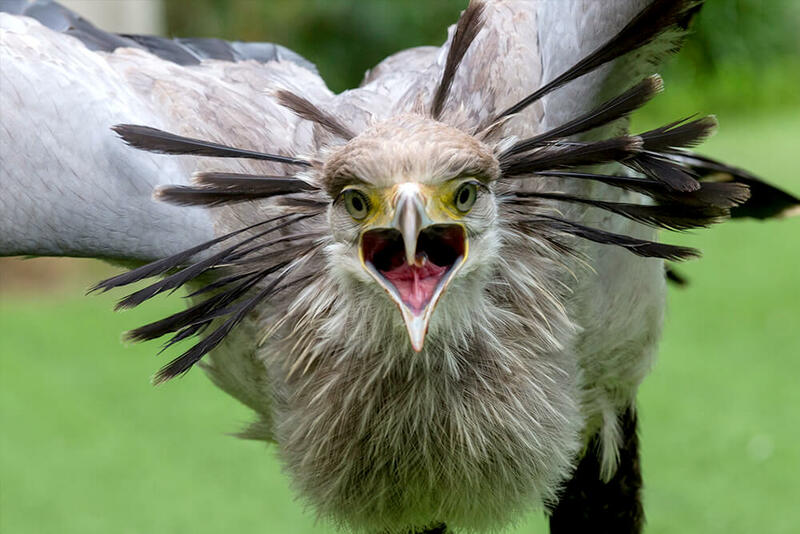 A venomous snake might try to bite the secretary bird’s flapping feathers, but they serve as safe distractions or targets, since a bite to a hollow feather wouldn’t hurt the bird at all! The secretary bird's feet are adapted for walking and lack significant grasping ability. Rather than carrying prey with the feet, food is usually either eaten right away or taken away in the beak. At the San Diego Zoo and San Diego Zoo Safari Park, secretary birds are offered a combination of a commercial diet made for zoo carnivores and thawed mice. Although they spend their days on the ground, secretary birds take to the trees for roosting at night and for nesting. Courtship for secretary birds takes place at any time of year, depending on how much food is available. Both male and female soar in wide circles and perform swoops and downward plunges, sometimes clasping talons in midair. The monogamous pair works together to build a large nest reaching up to 8 feet (2.4 meters) across. The nest is built of twigs, sticks, animal fur and dung, leaves, and grasses. The busy couple works on and visits the nest for up to six months; pairs often use the same nest for many years. One to three pale-green eggs are laid every two to three days, and the female does most of the incubation duties. The eggs hatch in the order they were laid, a few days apart. Both parents feed regurgitated and liquefied insects and small animals directly to the youngsters. Unlike other birds of prey, secretary bird parents often raise more than one chick successfully. Secretary bird chicks fledge at about 12 weeks of age. For the first few weeks, one parent is always on the nest, feeding and caring for the chick. Within 10 days, the secretary bird’s distinctive bare patch becomes visible on the face but without the bright orange coloration. By the third week, the chick has an unmistakable secretary bird face, crest feathers start to emerge, and long eyelashes become visible. In the beginning, the parents tear up small pieces of meat for the chicks to eat. At about 40 days old, the down-covered babies learn to eat small mammal and reptile parts that the parents drop directly into the nest. By six weeks, the chicks look like fully feathered, miniature versions of an adult. They exercise their wings at around 9 weeks and fledge at 12 weeks of age. Fledging for a secretary bird usually means a somewhat controlled fall out of the nest with lots of wing flapping until the youngster hits the ground! Parents then teach their offspring how to hunt, kick, and fly; the youngsters wander off on their own soon after. Usually quiet, secretary birds do vocalize if needed. A deep, low croak or a roaring groan can be made during a courtship flight, during fights, or to defend territory or a nest, as crows and kites often attack secretary bird nestlings, which are easy targets in their treetop nests. A single high croak is made when the bird is alarmed, and soft clucks and whistles are used between mates. To beg for food, chicks use a soft cheeping call that changes to squeals and loud brays as they get older. The San Diego Zoo’s first secretary birds arrived in 1939. At that time, no secretary birds had bred in any zoo facility. It was thought perhaps zoos did not have enough room to give the birds, which perform aerial courtship rituals. In 1971, the San Diego County Council of Camp Fire Girls raised money to fund the purchase of a pair of the birds for the fledgling San Diego Zoo Safari Park. In 2002, a secretary bird pair at the Safari Park’s off-exhibit Bird Breeding Complex, housed in a large flight aviary with several other bird species, showed an interest in breeding. The pair was seen carrying nesting material to a tree, and before long, they had a very large nest built of sticks, twigs, and grasses at the top of a tree. After two eggs were laid, the eggs were placed in an incubator for safekeeping, due to the parents’ lack of experience, and replaced with plaster-filled artificial eggs for the parents to incubate. The chicks hatched and were hand reared, and the parents laid more eggs. After three chicks were successfully hand reared, the parents were given a chance to raise their own. After two unsuccessful tries, they succeeded in hatching and raising one chick in 2004, a first for our organization! Since that time, we’ve welcomed 22 more secretary bird chicks. In recent years, the San Diego Zoo Safari Park has been one of only two North American zoos to have successfully raised this species. With our success, we will continue to be able to collaborate with other zoos to help expand the breeding program throughout the US. Currently, there is a pair of secretary birds in the Zoo’s Elephant Odyssey. They can be seen across from a life-size statue of another long-legged, but now extinct, bird: the Daggett’s eagle, a predator whose hunting behavior was similar to that of the secretary bird’s. At the Safari Park, we have over a dozen secretary birds, including a pair on exhibit in the Park’s African Outpost, and two (Karani and Aren) that are part of our Frequent Flyers bird show. Karani is a mature female who hatched in 2008; Aren, a young male, hatched in 2012. They can both be seen performing a natural secretary bird behavior: stomping a snake! However, the snake used in the show is made of rubber. We are the only facility in the US to feature trained secretary birds, and there are only an estimated four other trained secretary birds worldwide. We still have much to learn about these amazing birds and how they raise their young. 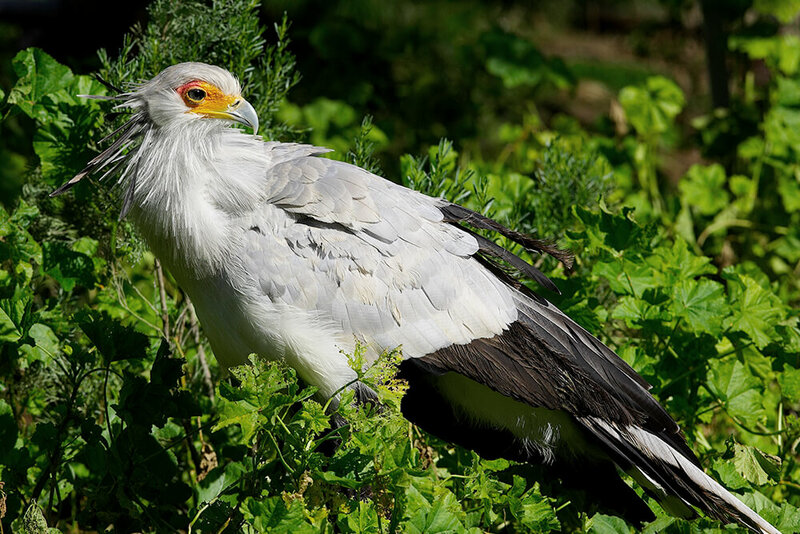 At this time, the secretary bird is common over much of its range and is protected in many African countries. However, habitat loss and deforestation could affect its future. In 1968, the species was protected under the Africa Convention on the Conservation of Nature and Natural Resources. 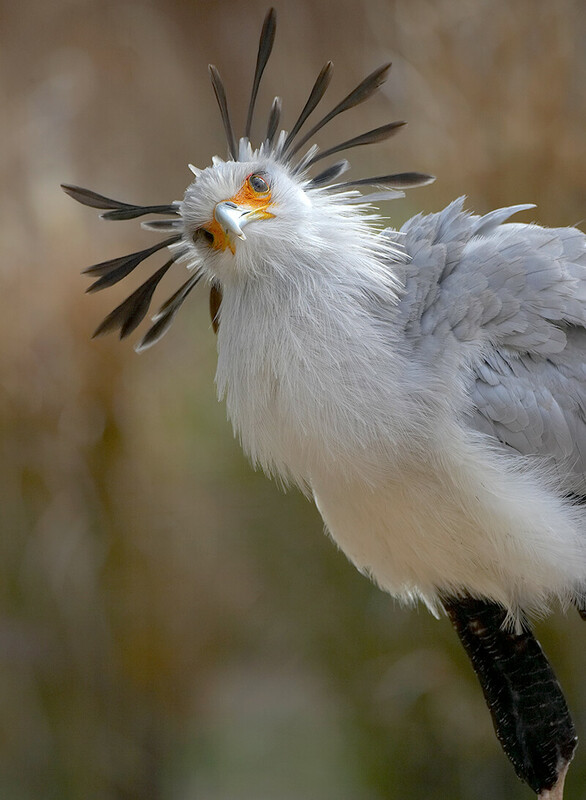 Its popularity among Africans may help protect the secretary bird in the future, while zoos such as San Diego Zoo Global do our part to increase awareness about the importance of habitat protection. The secretary bird’s taxonomic name, Sagittarius serpentarius, means “the archer of snakes.” The bird is famous for its snake-hunting abilities. The secretary bird has the longest legs of any bird of prey.